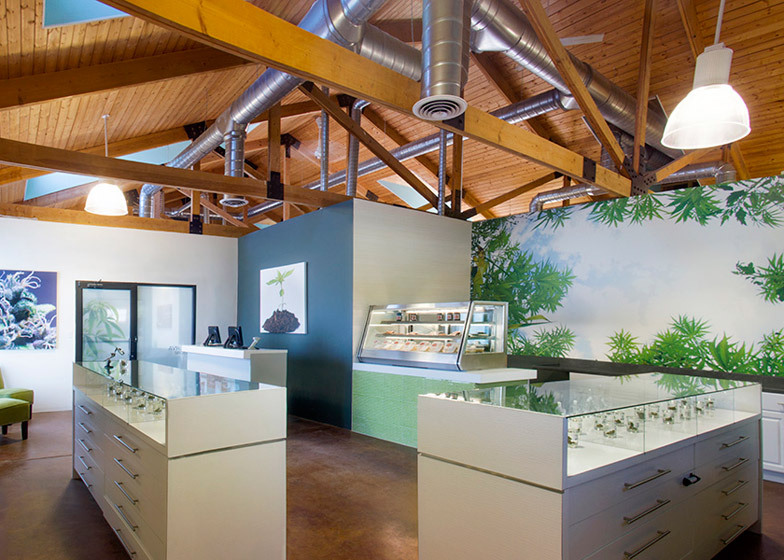 Interview: Megan Stone designs interiors for the USA's booming marijuana industry. She told Dezeen why "2015 is the year for cannabis in our country". Stone, who runs The High Road Design Studio in Phoenix, Arizona, says business is booming as attitudes to the drug in America undergo dramatic change. "Cannabis is the fastest growing industry in our country, according to Forbes magazine," she said. "I can't even keep facts and figures straight anymore when it comes to the number of states actively working to pass cannabis reforms, or who is likely to legalise it fully in our next elections." The substance is now legal for medical use in 23 states, and will soon be legal for recreational use in four states. Public perception is changing too, with over half of Americans now supporting full legalisation. Stone designs dispensaries, where cannabis is distributed for medical use, and shops, where it is sold legally. "My mission is to elevate the cannabis industry through professional retail design," said 31-year-old Stone, who set up her studio in 2013 after completing her design studies. Through her work she is helping to overturn the "hippy-stoner" connotations of cannabis and create a new aesthetic for the substance, which has traditionally been served in grungy venues full of "Bob Marley posters, pot leaves, dirty mason jars and stoned employees". "I am doing everything I can to break these stereotypes," she said. "The retail stores in our industry have an enormous potential to be incredibly cool spaces that provide an exciting product, a unique service, a brand new social experience, and a nice living for their owners and the people who work in the industry." Marcus Fairs: Tell us who you are and what you do. Megan Stone: I am a patient, turned budtender, turned dispensary manager, turned cannabis retail designer. I started The High Road Design Studio in 2013 upon finishing my interior design degree and realising – after six years of experiencing the cannabis industry from an insider's perspective – that the retail stores in our industry have enormous potential to be incredibly cool spaces that provide an exciting product, a unique service, a brand new social experience, and a nice living for their owners and the people who work in the industry. My mission is to elevate the cannabis industry through professional retail design. I help my clients design and execute highly functional and beautiful cannabis retail experiences that help bring our industry into the fold of our communities, and grow beyond the negative stereotypes of the past. Marcus Fairs: How did your design involvement with cannabis start? Megan Stone: I was going through interior design school and working in a dispensary at the same time. Having the opportunity to be immersed in both of these passions simultaneously gave me a unique perspective on cannabis retail from the inside out, through the eyes of a designer. I had the opportunity to test my design skills when the owner of the dispensary I worked for asked me to help do a little polishing and primping of our retail space. The simple updates we made – fresh paint in a sophisticated colour, new floors and display cases, a more sales-friendly layout – made huge differences to our patient's experiences in our store, and quickly showed in the growth of our business. Seeing first-hand how starved the customers in this industry were, and still are, for a more professional cannabis experience – as well as how great it was for the business itself – definitely helped light the path I took with my business. Marcus Fairs: Tell us about some of the projects you've worked on. Megan Stone: I have had the opportunity to work with both medical and adult-use shops. I have done everything from creating floor plans for permit applications to helping remodel existing shops. Every project is unique as regulations vary from state to state and even city to city. There are several different operational models that clients can potentially have that effect the flow and retail experience in the front and back of the house. I approach my projects from a team-minded position. I want to ultimately provide my clients with a way to make their business the best it can be. It starts with creating a solid, well thought-out space, and then looking over that functional core that is unprecedented, memorable, and inspiring. Marcus Fairs: Who are your clients? Megan Stone: My clients are typically dispensary owners. Many are experienced in the cannabis industry, but not necessarily masters at being retailers. They know they need help and can do better but they don't know how to do it themselves, nor do they want to. They value the expertise I bring to the table and appreciate that I can speak their cannabis language, ask them candid questions about their retail operations, and help them think through potential issues that they probably hadn't considered before. Sometimes, my client is the owner of the building who is investing in the space as a way to ensure he has a successful business occupying his property. Marcus Fairs: Do you work on projects that aren't related to cannabis as well? Megan Stone: I have in the past, but right now I am consumed with cannabis projects. This is a hot industry right now, and I don't see it cooling down anytime soon. Marcus Fairs: Are there any other designers in the USA doing what you do? Is it an emerging field? Megan Stone: I have found a couple of potential competitors, but I have not found any other designers that have a background in the cannabis industry. That is what sets my business apart, I know how to design cannabis retail so that is meets the needs of the patients/customers, employees, and owners. I know how the product is sold and how it moves through the space. I hope this is an emerging field because there is a lot of progress to be made and I can only help so many people by myself! Marcus Fairs: How does designing for cannabis outlets differ from any other type of interior design? Megan Stone: The regulations and laws regarding marijuana are complex and inconsistent across the country, and the product itself is pretty unique. For some, it is saving their lives, for others it is merely a pleasure, so designing the space to be inclusive of both kinds of customers is key. These are probably the most common differences between these stores' needs and those of non-cannabis retailers. It's a unique blend of security, efficiency, restrictions, wellness, education, freedom, experimentation, medicine, retail and consultation. That, and I don't know of many other businesses who have to conduct their business in all-cash. That presents a few areas where design is very critical for safety and security. Marcus Fairs: What kind of "look" do you go for? Megan Stone: I personally like clean, modern designs that incorporate contrast, textures and natural materials. But I try to fulfil my clients' visions and also create spaces and experiences that are unprecedented, just like the cannabis industry. Marcus Fairs: In Europe cannabis still has hippy connotations. Is that true in the USA? What kind of aesthetics are linked to cannabis there? Megan Stone: There is still a hippy-stoner stereotype going on in the USA, but I think that is slowly changing as marijuana becomes more mainstream and accepted. Some of the common aesthetic stereotypes that come to mind when the average person thinks of a dispensary: Bob Marley posters, black light imagery, pot leaves, dirty mason jars, cheap glass display cases, head shops, and stoned employees. I am doing everything I can to break these stereotypes and reinvent them into something more realistic and appropriate to the average cannabis user this day and age. Marcus Fairs: How are attitudes to cannabis in the USA changing? Can you tell us about changes in public opinion and legislation? Megan Stone: Let me tell you, 2015 is the year for cannabis in our country. Cannabis is the fastest growing industry in our country, according to Forbes Magazine. I can't even keep facts and figures straight anymore when it comes to the number of states actively working to pass cannabis reforms, or who is likely to legalise it fully in our next elections in 2016. 23 states including Washington DC have legalised medical marijuana, plus Colorado, Washington State, Oregon, and Washington DC who have also legalised it fully for adult use. Over 30,000 people are employed by the cannabis industry that we know of. 85 per cent of Americans now support legalising it for medical purposes, and over 50 per cent support legalising it for adult use. 57 per cent of Americans live in states with marijuana reform laws on the books already. Last year, the medical cannabis industry served over 1.2 million patients. Marcus Fairs: Is your design work helping change attitudes? Megan Stone: Yes, good design has an incredible impact in this industry because it provides the experience that I think most people want but have never encountered in the cannabis world. Our retail stores are where our industry makes contact with society, it is where we exist. For most people, their dispensary is the only cannabis experience they will ever have, so making sure this experience is positive and memorable is crucial. It is where we can actually show the world who we are and what we do. Marcus Fairs: Your website mentions "the new look of the cannabis industry" – what do you mean by this? Megan Stone: It means a look that reflects evolution, knowledge, style, innovation, modernity, security, beauty, wellness, and inspiration. Marcus Fairs: Do you smoke cannabis yourself? Do you smoke while you're working?! If so, does it help your productivity and creativity? Megan Stone: Haha, yes. I have enjoyed cannabis for most of my adult life. I have been a registered patient since 2007 when I moved to California. Cannabis helps me focus, think positively, be creative, and stay calm. I use cannabis when I need to, and sometimes that is while I am working. It is really a wonderful plant, and as a woman, it is a much safer remedy than pharmaceuticals for many of the issues we face – anxiety, depression, hormones, PMS, insomnia, libido... I could go on. I love cannabis, and I appreciate being able to say that out loud and not feel ashamed.